Earn up to 2,472 reward points. Easy to install and produces professional results! 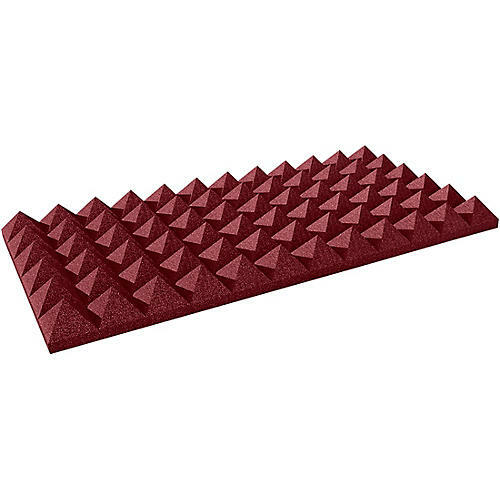 As with 4" Studiofoam Wedges, 4" Studiofoam Pyramids are recommended for larger spaces, rooms with pronounced low frequency problems or where sonic accuracy is mandatory and stronger acoustic absorption is required. Having 4 sides exposed on each pyramid also yields more sound wave diffusion, which is desirable in some spaces. Thus, 4" acoustic Studiofoam Pyramids will yield less overall dryness than 4" Studiofoam Wedges. This particular package includes six 2"W x 2'H x 4"D panels which will cover 24 square feet of wall space. Cover your walls and get better studio results. Order today! 2' x 2' x 4"
1 Tubetak or Tubetak Pro covers up to 24 square feet.